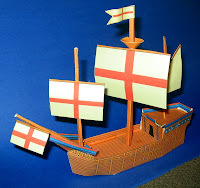 I got it in my head to create a paper model of the Matthew... and here is the result! I think it looks rather spiffy, if I say so myself. So as a Christmas gift to you, here are three caravels in PDF (Acrobat Reader) format that you can build— includinga 15th Century English Caravel in the Matthew's colors, a pirate version, and a version that lets you add whatever colors you like! You can find them all (and the instructions for building them) here. Oops. I recently did some work on the server where the model files are stored and apparently inadvertently removed them. I'll correct the error. Thank you for letting me know! Having had a second look, it appears all the links are fine from the blog. You might want to try again.